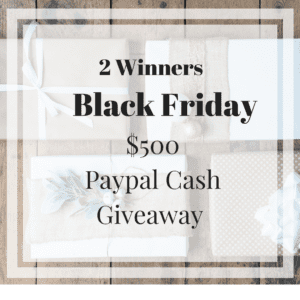 Loving Londyn: Black Friday CASH Giveaway! Hi everyone! Happy Thanksgiving Week! Thanksgiving is one of my FAVORITE holidays! My mom and I have a tradition of cooking together and it's something I look forward to every year! And let's not forget about all the major Black Friday deals the following day...those are always fun too! To show you how thankful I am for YOU, I am partnering up with some of my favorite bloggers to give away $500 paypal cash (each) to two lucky followers! The giveaway starts today and the winner will be announced THIS Friday so you can have the money to shop all the sales! Wishing you all a very Happy Thanksgiving and good luck!